Observe citizens’ rights to express their views about addressing the problems of English speaking Regions. 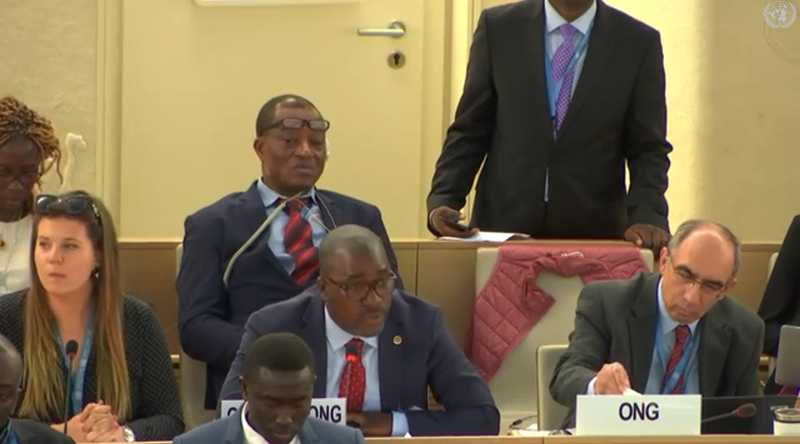 Although specific references to human rights issues of the English speaking minority are new to this UPR, during its first  and second UPRs,  Cameroon supported recommendations that it strengthen its human rights frameworks and continue to investigate acts and threats of aggression against rights defenders. Cameroon did not support recommendations that it take additional steps to ensure freedoms of expression and the press. The arrest, arbitrary detention, torture and ill-treatment,  and wrongful conviction by military tribunals of civilian rights defenders promoting equal rights for Anglophones, indicate persistent disrespect for the internationally protected rights of Anglophones, resulting in a humanitarian crisis. There are an estimated 411,358 Internally Displaced Persons  and more than 122 villages burned . Implement, through peaceful and legal means, effective policies to ensure equal and non-discriminatory legal, educational and social services for Anglophones. UN Human Rights Council, Report of the Working Group on the Universal Periodic Review: Cameroon, A/HRC/39/15, 10 July 2018, available at: http://ap.ohchr.org/documents/dpage_e.aspx?si=A/HRC/39/15. UN Human Rights Council, Report of the Working Group on the Universal Periodic Review; Cameroon, A/HRC/11/21, 12 October, 2009 available at: https://documents-dds-ny.un.org/doc/UNDOC/GEN/G09/163/96/PDF/G0916396.pdf?OpenElement. Wirba Diminus was severely tortured with the use of a hot electric iron resulting in severe bodily harm. See Statement by the Centre for Human Rights and Democracy in Africa (CHRDA) on “The Unlawful Treatment of Detainees at the Kondengui Maximum and Principal Security Prison in Yaounde-Cameroon’’ of Monday 17th September 2018 available at www.chrda.org. See CHRDA Report on “The Plight of +400,000 IDP’s” of 25th August 2018 available at www.chrda.org. The cases of convicted journalist Awah Thomas, as well as Fri Cristabel, Ngalim Felix, Bah Paulinus, Rev. Father Ambeizei and Mbuh Rene are prominent. See Statement CHRDA on “The Unlawful Treatment of Detainees at the Kondengui Maximum and Principal Security Prisons in Yaounde-Cameroon” of Monday 17th September 2018 available at www.chrda.org.